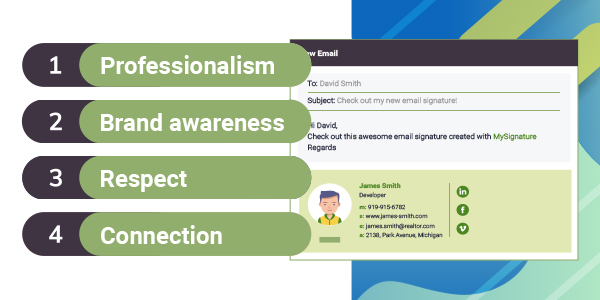 Professionally designed and visually compelling HTML email signature may significantly influence the recipient’s reaction to your message. When the person sees an informative signature with all needed information to contact you anytime, to buy your product, or just to visit your website, it displays that your care and respect the recipient. Now, your task is to rethink your attitude to the way you finish your emails. In turn, I’ll try to help if you arrive at the idea that the email signature really matters. Why you need the HTML email signature? Professionalism. A good HTML email signature is only a part of the whole email. Subject lines, texts and messages, and style are important for an effective email. However, if all these elements are accompanied by a poorly designed signature, it will display your unprofessional performance. Make sure your email is complete, and all elements are on their places, including the HTML email signature. Brand awareness. Creating a distinctive HTML signature is essential for brand promotion. Every email you send – no matter what the topic and message is – will display your brand and associate the email with your company and your product. Respect. Every time you write an email, you do that with a specific purpose, and you expect the recipient to take some action after reading it. That is why you should respect the recipient’s time and create emails that are easy to read and include only valuable information. Not to overload the person with too many details in the email body, simply move it to the HTML email signature. It might be the link to your website or data about upcoming events. Connection. 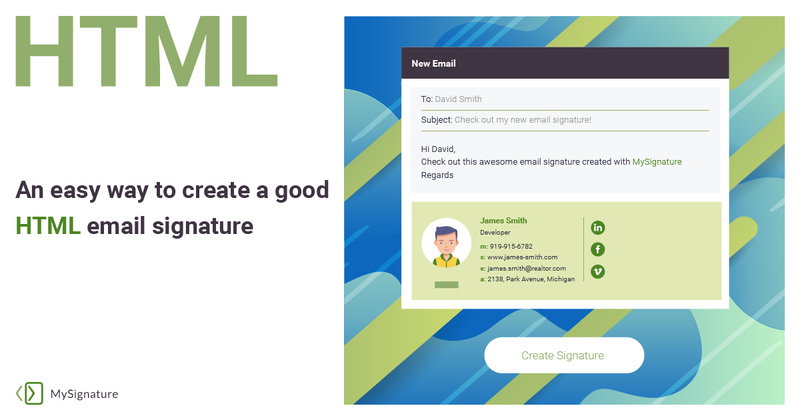 HTML email signature allows you to provide the recipient with contact information without including it in the email body. The possibility to quickly contact the person without looking for a specific email is the biggest benefit. Because each email has contact details like a phone number, additional email address, links to social media, and others. Why to choose a free MySignature HTML email generator? It is easy to get lost among the majority of services available on the web and offering you to generate unique email signatures. 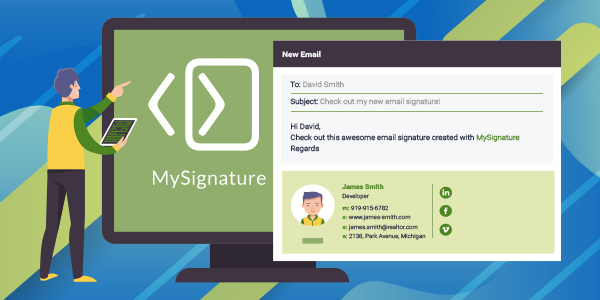 MySignature has a set of advantages over all of them. First of all, you do not have to be a programmer or a technical geek to be able to generate a good HTML email signature. Secondly, there is no need to read multi-page guidebooks to learn how MySignature operates. It is easy, intuitive and straightforward. 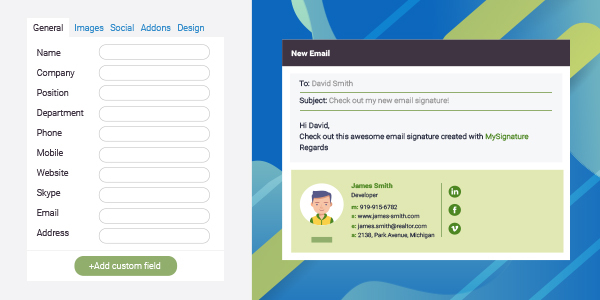 Moreover, you can create a free HTML email signature for any email client whether it’s Gmail, Thunderbird, Outlook or Apple Mail. How to create a professional HTML email signature? To make it easy for you, I have prepared a brief guide how to create a good HTML email signature with MySignature. Just follow the steps below to do everything right. First of all, you have to sign up for MySignature or log in to your account if you already have it. Once you’re logged in, go to your Dashboard and click the New Signature button. After clicking New Signature, you will see the table with 5 tabs: General, Images, Social, Addons, Design. In the last tab, choose the design of your future HTML email signature. In the MySignature library we have multiple templates, so you will definitely find the one that suit your needs. Click Finish to leave the editor. On the right, you can now preview the HTML signature you have created. Choose to copy the email signature to the clipboard to further insert it in your email account settings or copy the HTML code below. These five steps might look scary, but they aren’t. The process is straightforward, I just tried to describe in details how you can create a professional HTML email signature without being a coder. Enjoy!